Chrysler's 300 with a turbo-diesel is a quiet and strong performer. "WHERE'S your bevy of babes?" "It looks like a drug dealer's car." "Are you wearing a purple jacket?" "What's up dawg?" 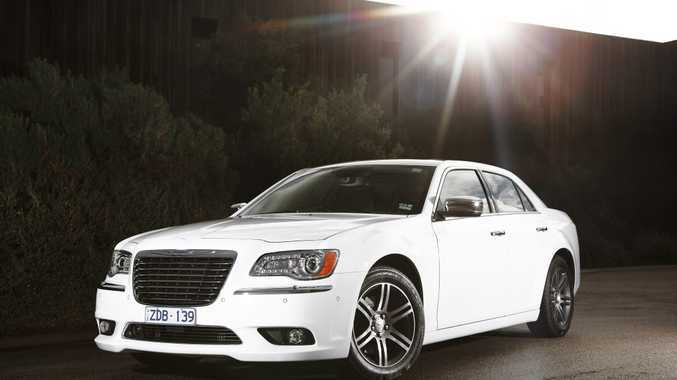 Opinions were hardly polarised when it came to a recent ride in Chrysler's 300. Yet it's probably not the reaction Chrysler is chasing nowadays with its big saloon. Marketing has been focused on the luxurious sedan being a timeless classic…rather than being the weapon of choice of the underworld. Subtle changes to the design have brought a more executive feel to the 300's persona - yet it remains a stand-out in the dwindling large vehicle crowd. Sit back in the big plush front seats (that are heated and ventilated) where cabin finish and quality is striking. Leather trim on the seats and dash, chrome trim with mocha wood accents along the dash and doors create a luxurious environment. The driver has a refined set-up, seated in an eight-way electric adjustable pew, with two main gauges highlighted in a blue hue sandwich a digital display. It's a big saloon, so as you would expect there is ample room for adults front and back. The transmission tunnel does take up some legroom for the unlucky one who has to sit in the middle of the bench seat. Not only has Chrysler made great gains in the interior quality but also in cabin serenity. There is little by way of noise intrusion and it feels every bit the upper-class cruiser. Fluffy and soft on the highway, the 300 surprisingly also has an ability to corner. While our Chrysler 300C Luxury sat on the hefty 20-inch rims it managed to deliver a fulfilling and likeable performance. The turbo-diesel is hardly audible and does a commendable job of pushing the near-two-tonne five-metres-long frame. With a massive 550 Newton metres of twist at your disposal the big 300 rarely feels its bulk. If you do find things a little sluggish, then you can enlist the assistance of the paddle shifters and take control of the five-speed automatic cog swapping. It's surprisingly flat when you attack a bend, while even the steering provides enough feedback to keep keen drivers happy. Specification levels are strong even in the base model 300, but step up into the 300C Luxury and you'll have little need for the optional extras list. There are some excellent standard features, including heated and ventilated leather-trimmed front bucket seats, heated rear seats, auto wipers, a power backlight sunshade, memory function for the radio/driver's seat/and mirrors, high beams which automatically dip when oncoming traffic is detected as well as a heated wood and leather-wrapped steering wheel. There is also the Uconnect Touch entertainment system with 21cm touch-screen system incorporating CD/DVD/MP3/ compatibility, Bluetooth connectivity Garmin navigation, USB port and audio jack input for mobile devices. It also has six airbags, radar cruise control, front and rear parking sensors with a reversing camera and a blind spot warning system. There's no diesel from the likes of Holden with its Commodore Calais V6 SIDI ($48,290) or Toyota's Aurion Presara ($49,990) , but Ford has the four-cylinder Falcon Eco Boost G6E ($46,735). Jaguar has the XF 2.2 Diesel Luxury ($69,900), while there is the Mercedes-Benz E-Class 220 CDi ($84,800) or maybe the BMW 520d ($80,700). Given the size of the 300, its average fuel consumption is an impressive 7.1 litres for every 100km. Servicing should be reasonable, although tyre replacement could be expensive depending on the size of the rims you select. The back seats fold 60-40 at the pull of a small strap which provides a useful stowage area. They don't fold flat but the boot is sizable…enough for a few golf bags or a body or two. Access to the three child seat points is easy on the back parcel shelf and you get some good storage spots, like two bottle holders that can cool or heat up front, a deep centre console and a spot in the middle perfect for the key. They do not come more distinctive. Like it or hate it, very few sit on the fence when it comes to the 300. It's bold, it's brash, it's unashamed of its proportions. When it comes to large cars, nothing meets this model in terms of value. The turbo-diesel is quiet yet robust, while the specification is what you would expect on a European offering at more than twice the price. Chrysler has put together a compelling package with the 300C Luxury…it's a shame the obsession with SUVs and small cars has gripped the nation. The good stuff: Stand-out styling, brilliantly quiet and strong diesel, Luxury model's specification list. We'd like to see: Foot park brake banished. Warranty: You are covered for three years/100,000km while roadside assist also runs for three years. Servicing is every 10,000km. Model: Chrysler 300C CRD Luxury. Details: Four-door large luxury rear-wheel drive sedan. Engine: 3.0-litre V6 turbo-diesel generating maximum power of 176kW @ 4000rpm and 550Nm @ 1800-2000rpm. Consumption: 7.1 litres/100km (combined average). Performance: 0-100kmh in 7.8 seconds. Bottom line: $56,000 (plus on-roads).